(1) Support for Secular Politics: A much higher percentage of the Sunnis, even higher than the Kurds in some years, believe that Iraq would be a better place if religion and politics were separated. This support has increased from 60% in 2004 to more than 81% in 2013. 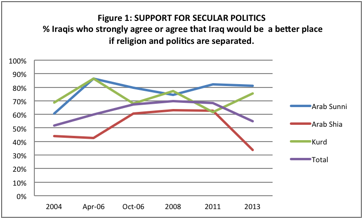 By contrast, support for secular politics among the Shia has an inverted U-shape between 2004 and 2013. It went up from 44% in 2004 to 63% in 2011, and then dropped to 34% in 2013. From the standpoint of public opinion, this evidence implies that the cooperation between the Sunni tribes/groups with ISIL (Islamic State of Iraq and the Levant) may not indicate mass conversion to religious extremism. Rather, it is driven by a common hatred of the Shia sectarian government ruling the country. (2) Recognition of Iraq (and not religion) as the basis for identity: The Sunnis and Shia converge in defining selves as Iraqi, rather than Muslim or Arab, above all. This support rose from 22% in 2004 to 80% in 2008, and then dropped to 60% among the Sunnis. Among the Shia, it was 28% in 2004, increased to 72% in 2007, and then dropped to 62% in 2013. There is not much support for Iraqi identity among the Kurds. Among the Kurds, on the other hand, there has been a shift from predominantly Kurdish identity to religion. Reinforcing attachment to the nation rather than to the religion of Islam in politics is the fact that both the Sunnis and Shia (1) prefer politicians who are committed to the national interests over politicians who have strong religious convictions by at least a factor of 4 to 1, and (2) consider a good government one that makes laws according to the wishes of the people over the one that implements only the sharia by at least a factor of 3 to 1. These findings indicate that neither the Shia nor the Sunnis would be interested in the partition of Iraq or in the implementation of a religious state, and the current sectarian struggle is for political supremacy rather than division. Iraq may converge to the Lebanese model of sectarian strife. (3) American Unpopularity: Well over 90% of the Sunnis and 86% of the Shia do not wish to have Americans as neighbors, with these figures remaining largely stable over the last decade. (4) Iranian Unpopularity: Iranians have become quite unpopular among the Sunnis. 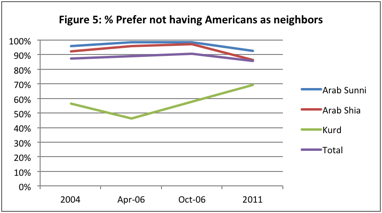 Fully 88% of the Sunnis in 2011 did not wish to have Iranians as neighbors. Among the Shia, Iranians were not as popular as might be expected, however. 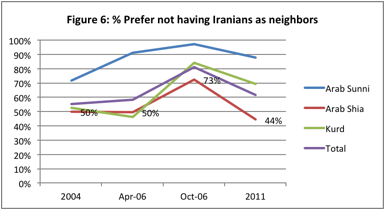 Those Shia who did not wish to have Iranians as neighbors fluctuated between 44% and 73% between 2004 and 2011. These figures have implications for the U.S. efforts to combat terrorism in Iraq and assist Iraqis in maintaining territorial integrity of their country. There is certainly a unity of purpose between U.S. policy makers and the Iraq public. Neither side wants an Islamic government nor wishes the partition of the country. The U.S., however, is facing two ruthless enemies with proven capacity to murder Americans; ISIL and other Sunni terrorist groups, on one extreme, and the Quds Force of the Islamic Republic’s Revolutionary Guards, on the other. Given the U.S. unpopularity, evidenced in part by the consistently negative opinion of Americans as neighbors, whatever the U.S. does is suspect from either the Sunni or Shia standpoint. The US must pursue a three-pronged strategy which: (1) weakens the ties between ISIL and the more moderate Sunni groups, (2) weakens the ties between Iraqi Shia and the sectarian Islamic regime in Iran, and (3) strengthens ties between moderate Sunnis and Shia within Iraq. Between the 2004 and 2013 surveys, the Sunnis expressed much more support for secular politics than the Shia or, recently, even the Kurds. The percentage of the Sunnis who strongly agreed or agreed that Iraq would be a better place if religion and politics were separated was 60% in 2004, 86% in April 2006, 80% in October 2006, 74% in 2008, 82% in 2011, and 81% in 2013. These values for the Kurds were similar to the Sunnis; 69%, 86%, 68%, 77%, 63%, and 75%, respectively. Among the Shia, however, support for secular politics were much lower, having an inverted U-shape; 44%, 42%, 60%, 63%, 62%, and 34%, respectively. Since the 2004 survey, the percentage of the Sunnis who defined themselves as Iraqis, rather than Muslims or Arabs, above all, has increased considerably. This percentage was 22% in 2004, 24% in 2006, then 53% in March 2007, 58% in July 2007, 80% in 2008, 68% in 2011, and 60% in 2013. Among the Shia, support for Iraqi identity has also increased since 2004; it increased from 28% to 32%, 62%, 72%, 67%, 64%, and 62%, respectively. Iraqi identity, however, is much lower among the Kurds; the percent Kurds who defined themselves as Iraqi above all fluctuated between a low point of 5% in 2006 and a high point of 20% in March 2007. Iraqis were asked to choose between two definitions of a good government (1) one that implements only the law of the sharia, and (2) one that makes laws according to the people’s wishes. A great majority of the respondent opted for the second option. That is, 86% versus 14% among Sunni Arabs, 75% versus 25% among the Shias, and 91% versus 9% among the Kurds in the 2011 Iraqi survey demonstrated support for a secular rather than religious government. Given the choice between the two statements that (1) it would be better for Iraq if more people with strong religious view held public office, and (2) it would be better for Iraq if people with strong commitment to national interests hold public office. Here again, national interest trumps religion, with 89% versus 11% among Sunni Arabs, 81% versus 19% among Shia Arabs, 60% versus 40% among Kurds in 2011 Iraqi survey showing support for secular politicians. 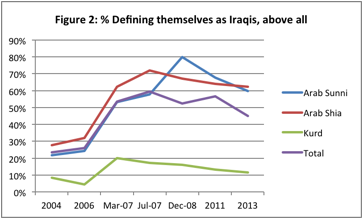 Americans have remained quite unpopuar in Iraq. Among the Sunnis, the percentage of those who did not wish to have Americans as neighbors fluctuated between 92% in 2011 and 99% in 2006; among Shia between 86% in 2011 and 98% in 2006; and among the Kurds between 46% in 2006 and 69% in 2011. Iranians have also grown unpopular among the Sunnis, as the percentage who did not wish to have Iranians as neighbors grew from 72% in 2004, to 91% in April 2006, 97% in October 2006, and then dropped to 88% in 2011. These values for the Kurds were 53%, 46%, 84%, and 69%, respectively. Among the Shia Iranians were not as popular as might be expected. Those Shia who did not wish to have Iranians as neighbors fluctuated between 50% and 73% between 2004 and 2011.